If you’ve ever dreamt of riding in far off lands, our December issue is for you as it features stories of world travel. 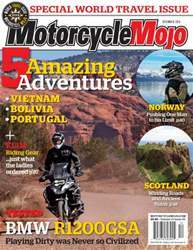 Entertaining travel articles in this issue come to us from; the highlands of Scotland on BMW R1200GSs, Bolivia as the author traverses the county on a Honda 125 in search of Che’s last stand, a harrowing experience trying to reach Norway’s Nordkapp, a tour in beautiful, sunny Portugal, and a nine-day Vietnamese adventure riding a Honda 250 Rebel from Hanoi to Ho Chi Minh. 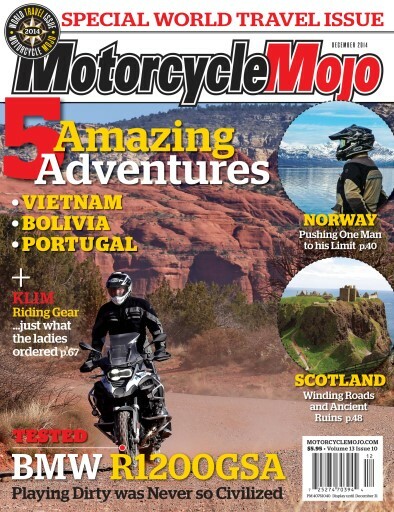 And what would a world travel issue be without a review of the 2014 BMW R1200GS Adventure. All this plus much more.